MÃ¼ and more This classic from the creative minds of Doris and Frank will finally be available in English. The game is a straightforward trick-taking game with a twist: there cards are in 5 suits ranging from 0-9, with duplicates of 1s and 7s. Players display cards to bid and can bid even after passing. When all bidders pass, the highest bidder (most cards displayed) is the head of the offensive partnership and the second-highest bidder (next most cards displayed, with ties broken by highest ranking card played) is the head of the defensive partnership. The second-high bidder chooses the undertrump, either a suit or a number. Then, the leader of the offense selects the overtrump. Then he selects a partner from the three players who were not the top two bidders. After cards are played and all tricks taken, the players score their tricks by counting the small triangles on them (0, 1, or 2). Small numbers have the most triangles; large numbers the fewest. With this game, you get several games in one! 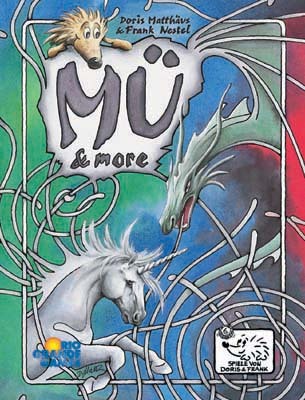 The main game (Mu) is a complex trick taking game that I would recommend to experienced players.